There is a view that the old icon in the home can harm its inhabitants. Someone thinks it is a superstition, but someone says that this allegation is groundless. And whether to keep the old icon at home, really? Icon, located in the house that can make the atmosphere more bright and blissful, as well as in some cases it can even prevent misfortune threatening the owners of the house. However, on the location in a residential area of the ancient icons of people's opinions is not so clear. Say that can be dangerous to keep her in the house. What is the danger?" Why people are afraid to keep at home the old icons? From the point of view of esotericism, any thing with "history" carries the strongest energy and "remembers" all the events – both positive and negative – that occurred with her former owners. Of course, that old icon for the period of its existence has changed many hands; besides, our ancestors always thought of icons as sacred objects that only adds to coming from things like vibration. It is believed that not every person is able to cope with the energy flows, which broadcasts old icon, debilitated or weak in the faith of the people such a thing in the house can be harmful. For this reason the priests of the Orthodox Church have a clear opinion about what the icon of the house in any case is the source only of goodness and light, and in any case not able to harm anyone. Such arguments are priests considered heresy and tough enough to stop them. On the contrary, the old icon is more "sacred" than modern, and therefore even more must be the object of veneration. The risks to the one who keeps the old icon at home? The owner of the old icons actually can be in danger, but it has nothing to do with the actions of Higher powers. The fact that written decades or even centuries ago, the icon has a huge cost, and some people want to have such a rarity in their private collections, can go to great lengths for this. The owner of this icon runs the risk of losing it at any moment if the attackers climb into his house. If by unhappy coincidence, someone from the family members at this moment will be at home, it can happen irreparable, because the value of old icons very large and in this regard, the robber is able to go at all. Really from stored in your home Shrine, you need to eliminate in order not to bring trouble on yourself and your family? Of course not. Just less abundantly on what relic have in your possession, and provide decent protection for your home. Very effective and quite inexpensive, for example, to contract with a security company – in this case, when unauthorized entry into your home within a few minutes a man in uniform will come and detain intruders. The preservation of the icon and transfer it to their descendants – it is the duty of a true believer. The house is a continuation of the temple. 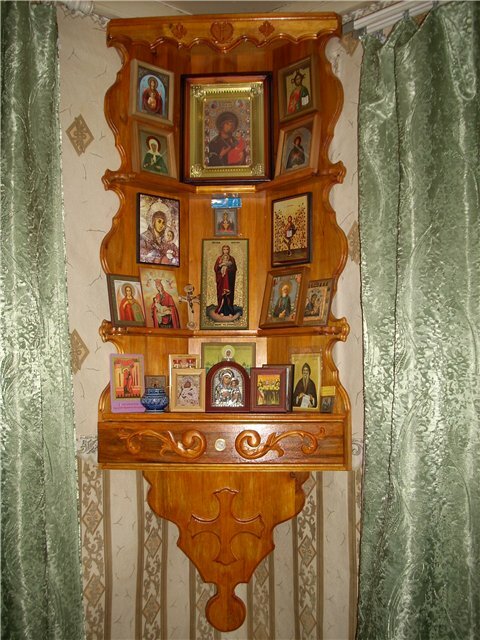 Before almost every Orthodox family it was customary to place in the house the most conspicuous place a shelf with icons, or even an entire home iconostasis. The number of icons and richness of their decoration in this case testified about the level of affluence and position its head in society. The location of the icons has several names: the red corner, front corner, the Holy corner, a Shrine, Shrine, Shrine. If you want to know how and where to hang the icons, we will be happy to explain. Some Orthodox icons hanging directly above the headboard. So it is possible a more efficient use of cramped space, with racks do not interfere with, and to sleep under the shadow of the shrines much nicer and calmer. Icons do not have to hang on the wall. They can be placed on a dedicated shelf. But if a lot of icons, it is better to hang them on the wall, observing some simple rules. If the icons in your room are hung asymmetrically, haphazardly and without any thought out composition, it will certainly cause a feeling of discomfort and dissatisfaction with the placement of the icons, the desire to change it. And this is very disturbing and distracts from prayer. Icons are also possible and even necessary to place in other rooms. The kitchen is to hang the icon. Be sure to place in the nursery the icon of the guardian angel or patron Saint of the child. According to tradition, was hung over the entrance to the apartment or the house icon of the Holy virgin. But now it can be replaced with any other icon or cross. By the way, placing icons in your apartment or home, please note that they should not stand or hanging together with other paintings (even on Bible topics) or elements of everyday life. Misplaced icons in bookcases, close to toys, cosmetics, photos of family members, statues. Do not place icons next to the posters of politicians, stars of show business, athletes and other celebrities. Infrequently, but still have to see the icons on the walls or on the shelves of pictures of the Holy fathers, monks, elders. It is canonically valid because the photograph captures a specific moment of the earthly life of a man, even a Church or even numbered subsequently canonized. The icon represents it in the icon of the Saint, in his transformed, glorified state. Of course, the presence of such pictures in the home is not canceled. But to put or hang up pictures need apart from the icons. The location of the icon in the room is sacred to the house. This place protects both the room and the whole house from the evil spirits that may try to visit the apartment. Therefore, it is necessary to know a few simple rules of how to arrange icons. The number of icons. It is best if each room of the apartment or home will be icons. If this is not possible, the icons should be placed in areas of the world." For example, this area is the kitchen. The layout of the icons in the room. The place where the icon, called the red corner. The red corner should be cleared from worldly objects, whether books, posters, and other Souvenirs. The distance between the icons and the rest of the stuff should not be less than 60 cm. The device is the place where are located the icons. According to the Christian canons of the icon must be located in a small wall locker that shall be closed the glass doors. In the days of Christian holidays next to the icons should be placed a burning candle. If the candle eventually goes out, it must be replaced. The icon should not hang on the wall. She needs to stand to have their point of support. According to your faith will it be done to you. You must remember the traditions of our ancestors and learn how to treat the icons and their placement in the house. Follow some of the advice, and everything will be fine. Since ancient times Christians have prayed, turning to the East. Therefore decided to equip the iconostasis in the Eastern side room of the house. If the layout of the room does not allow it, select the next to the East corner or wall. Following the godly traditions, they should not be absolutized. Some of the icons are allowed to be placed on other sides of the house, that the spirit of Holy images have always supported us and adjusted on positive emotions. The altar on the East side built Orthodox churches. The main thing - that before the "red corner" was enough free space to commit the common prayer of the whole family. 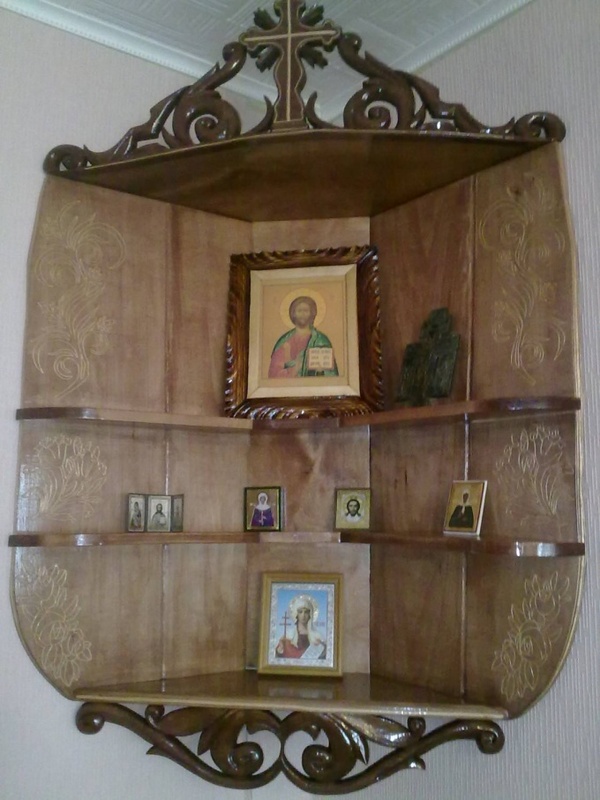 It is desirable for the iconostasis to allocate a roomy shelf. If it will not fit all the icons, the other to hang on any wall. Wrong will place the icons in the book or other cabinets as there should not be foreign objects. Icons can serve as interior decoration. Of course, that each house should be icons of Jesus Christ and mother of God. The icon of the Savior, place right, left – the icon of the virgin. It is also important to observe the principle of hierarchy. Any icon should not be placed above the icons of the Trinity, of our Savior, mother of God and the apostles. It is desirable that the iconostasis is crowned with the Christian cross. Icons you can have in the dining room, where lunch households that before the meal was to pray to God for daily bread, and after dinner – to thank. Above the entrance to the home traditionally post the icon of the blessed virgin. Among the icons should not be artistic paintings and engravings of biblical scenes, which a priori are not canonical icons. Accordingly, there is no place for images of monks, elders and priests, even enumerated by the Church to sainthood. They can be placed elsewhere. Icons in the house. 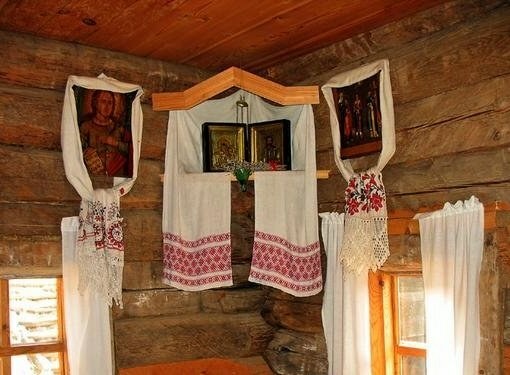 Home decoration with icons from ancient times was one of the main customs of the Russian people. Today faith back to the people, and with it reverence for the icon. There is an unspoken list of icons that need to have a home. First and foremost, we are talking about the icons of the Saviour and mother of God. A man in the temple praying before the Holy icons. Should do this at home. Before every house the Russian people were icons in the red corner. But in the era of "red corners" people have tried to erase even the memory of the Church, few survived and the memory of what icons need to have in the house and how they should be placed. Where to place icons at home? In a free and accessible place. With the revival of Orthodoxy in the houses of the Russians are increasingly found icons. Traditionally it is believed that it is better to pass by inheritance or gift, so the icon is usually bought as a gift to devout friends, their children or their godchildren. The image of the Godmother will be with reverence and love adopted in any home. Select the icon of the mother of God is necessary, guided by intuition, or "in his heart". 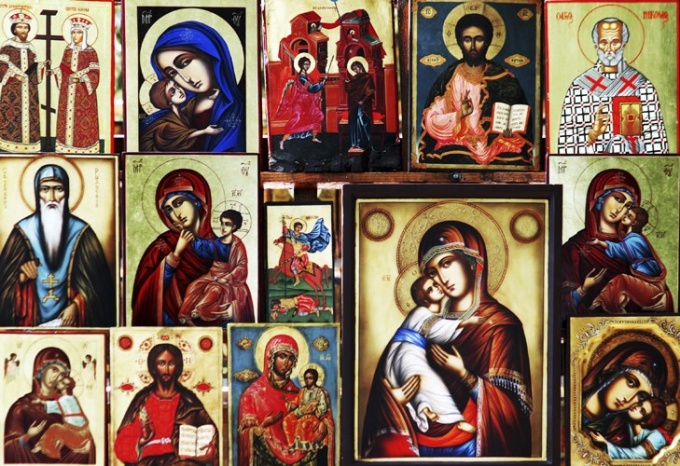 You can choose the icon of the mother of God in an antique shop, art show, or buy it in any monastery, which has its own icon painting workshop. It is believed that the ancient, sacred icons, have great strength, but the Holy elder in his theological works argued that any consecrated image is the Shrine. They say that the lithographic image, pasted on wood, and an old family strong our faith. 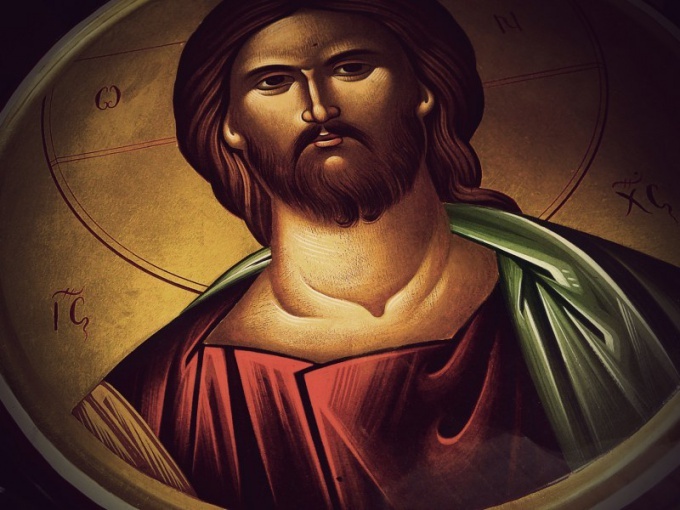 Therefore, if you do not have enough funds to purchase expensive rare icons, buy image new email or conventional lithographic icon in any Church. Icon of the virgin written in the Church canons and depict several traditional subjects, so they have the same name. You can buy the Theotokos: "Vladimir", "Kazan", "Tikhvin", "Feodorovsky", "Iver", "Smolensk-Novgorod". In addition, there are icons: "Tenderness", "Support to the humble", "perishing", "unexpected joy" "vsetsaritsa" and many others. There is a list of diseases and afflictions, which lists some of the diseases and troubles and protects one or the other icon of the mother of God. If the person you are giving the icon, there are problems, choose a gift that way, which we must pray for deliverance from them. The image of the virgin you need to have in every home. If you do not give the icon to the target destination, then select the image of the iconographic type of "Affection" or "a guide" ("Protectress"). The first type is the icon of the mother of God: "Vladimir, "don", "Tolga", "Theodore". The second is "Kazan", "quick to hearken", "Tikhvin", "Iver". If you want to hang the mother of God icon in front of the house, choose for this canonical image "of the blessed virgin". Icons are traditionally placed so that turning to him during the prayer, people stood face to the East. Put them on a separate shelf, covered with a napkin, or hung on the wall. In Orthodox homes, you can often find iconsthat represent for believers, the image of the Savior, mother of God or the saints. If you bought the icon recently, you should know a few rules of placement of these Holy images in the house. Icons are sold not only in the Church but also in secular stores, souvenir shops; bought in this location, the image will consecrate the Church. If the icon you have acquired in the Church, she is already sanctified. Look for icons such place to in front of her had a lot of free space, and the whole family could fit for prayer. Place it on a shelf or hang on the wall. Note that during the prayer it is customary to face East, so it is advisable to hang an icon on the East wall. The best place for icons in the red corner, that is, the Eastern or the right of the entrance. You should try to place in the house of the icon of the Savior and the Theotokos, the icon of the Savior should be placed on the right and the Theotokos on the left. 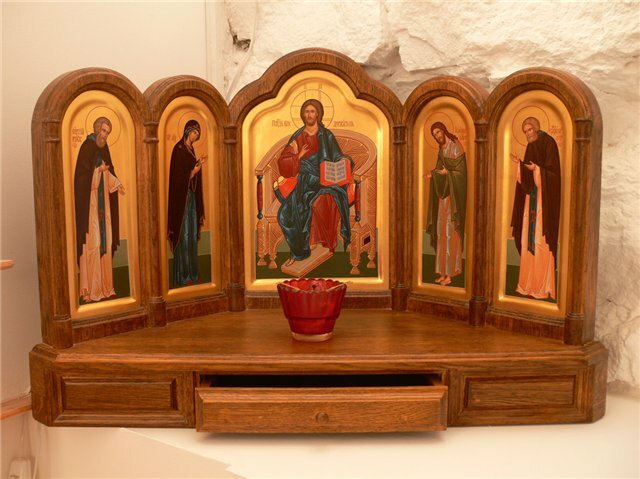 Images of saints, venerated in your area, place below the icon of the Trinity, the virgin, the Saviour, the apostles. Well, if you have the opportunity to crown your iconostasis of the Orthodox cross. Place icons in a separate location, away from other items. It is not necessary to place them in bookcases or on a shelf of the cupboard, if there are books of non-religious content, cosmetics, pictures, toys, etc. Before you hang the icon on the wall, remove all paintings, posters, singers, athletes and other figures. Even photos of priests or monks, paintings on biblical subjects is unnecessary. Be sure to hang an icon in the kitchen or in the dining room that the family members always had the opportunity to pray before meals. Also, the icon can be placed in the bedroom or any other room, the main thing that in front of her and a prayer was lifted up. Above the entrance, place the icon of the Holy virgin or any other. Can also hang an icon in the headboard. The main thing with the posting of icons to anything you are not distracted from prayer, did not appear to outweigh the desire of a Holy image or to do some business. Home altar – a place for prayer and meditation. For centuries in Russia the main, more Holy, or called red corner that had a home iconostasis. The Shrine or the Shrine (the ark) hung on the East side, as well as placed the altar in the Church, as the Eastern Christian tradition has a special symbolic meaning. Try to place the icon in the Eastern corner of the room or on the East wall of the building. According to the Bible it was in the East lit the star of Bethlehem and there shall come the sign of the second coming. If this is not possible, simply choose a location that will be visible from the doorway of the room. Around him should be enough space to during the joint prayer of the believers (if there are several in the house) did not touch each other, not crowded in front. Avoid stir the icon next to the symbols of secular life paintings, posters, wall decorations. Not a valid neighborhood icons and household appliances, especially TV and computer.It is best to put the icon on specially for it suspended the shelf because next to it, there may be other religious items such as candles, a bottle of Holy water, chrism, sometimes next to the icon put palm, birch or willow branches, flowers. Besides, it is customary to hang one icon, but several Central with the face of the Savior at the right hand of her icon of the virgin and child. Kyoto in the home are often present wedding icons, icons with the Saints members of the family, clan or house icon. It is also worth considering that before the icon or icons should illuminate the lamp, illuminating the faces of the saints. Home crowns the iconostasis, the cross.Often believers are not limited to an icon or more in only one room, and place them in each room. Hanging separately icons to decorate embroidered towels. Include them also in the red corner, so that they were visible from everywhere in the room. You can put the icon on the bookshelf, but only on the condition that it, and all over the bookcase, kept religious literature and secular books – novels, textbooks, reference books, etc. is Unacceptable to put the icons in so-called "roller coaster", let it even kept the front and expensive porcelain figurines.Orthodox Christians pray before and after meals, so the dining room or the kitchen, if the family eats there, you should also place the icon of the Savior.